Rather unexpectedly, it’s dark and white this morning; obviously we need to keep more of an eye on the forecast, as we hadn’t noticed it was on the way. Fairly typical southern English snow – wet and sloppy and the temperature is hovering above freezing. 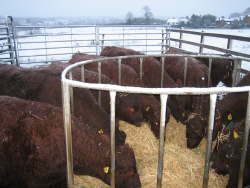 Actually now that the cattle are inside, we feel a bit like whatever happens we can cope – just need to keep at it. Having said that, snow on the ground for a while will be a nuisance as it makes picking up hazel and willow difficult and unpleasant. But on a morning like this it is a great feeling to feed the cattle knowing they can spend most of the day under cover on a dry bed of straw. Roll on April though.